I’ve been cleaning the door hardware. It had all been painted numerous times but with some guidance from This Old House I was able to restore it as best as I could. Below are the before and after face plates from one of the bedroom doors. The play room is almost done. Jerry put in the window and did the trimming all around. Peggy will finish the trim painting and it will be ready for the carpet. I’m still waiting for her choice of light so I can install it. Here are the two most recent pics for comparison. The bathroom tile floor turned out quite nice. Need to buy a toilet and a vanity. The dining room was painted and the floor cleaned and varathaned. It will get a new light but that’s down the road. Again, before and after pics. 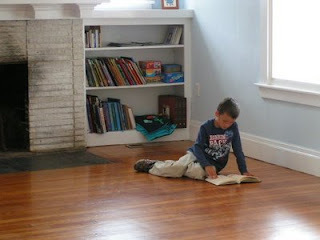 The front room area as it is now, with Nikolai enjoying one of his favorite pastimes. You have done such an amazing job on this house! I’m sure if it could talk, it would thank you for taking such good care of it. It’s been a while since I’ve been over, but it looks fantastic. That blue with the heavy white trim is really nice. Wow! I am amazed by how great it looks; kudos to you all! There is such a sense of pride gained in restoring a home by yourself.